Structure of the fauna of Warsaw the study area. Structure of enchytraeid (Oligochaeta, Enchytraeidae) communities in urban green areas of warsaw. Structure of soil click beetle (Coleoptera, Elateridae) communities in urban green areas of Warsaw. 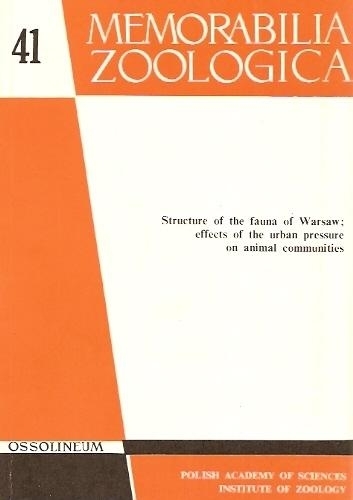 Structure of Ichneumonidae (Hymenoptera) communities in urban green areas of Warsaw. Structure of Sphecidae (Hymenoptera) communities in urban green areas of Warsaw. Structure of neuropteran (Neuropteroidea)communities in urban green of Warsaw.